the mighty dave t, in a previous life, was a painter. not, you understand a contemporary of david hockney or john bellany, but a man whose entire year's work involved the window frames, walls and doors of a large hospital building. you can tell by the brief snippets of conversation that occur during a pleasant sunday morning bike ride that he was good at his job, and it only takes us to pass ineptly prepared or painted building works to have him explain in his inimitably laconic style just where they'd gone wrong. thankfully i've only ever seen the inside of a hospital building for a relatively brief period of time, but on several occasions, i've passed the exteriors of substantially sized hospital buildings and taken note of the surface area that could conceivably require painting; and on a regular basis. as this is the united kingdom, if painting out of doors were only to be undertaken in fine, warm, sunny weather, most of the country's buildings would be in a sorry state of repair. you might infer from the foregoing that the mighty dave spent a reasonable proportion of his time out of doors, during which, as he is keen to relate, he became the hardened and rugged sprinter that we all revere to this day. this pretty much explains why he rides, even on a cold midwinter's day, with only short fingered track mitts while the rest of us are manfully wrestling with 15 tog sleeping bags covering our frostbitten fingers. even in cold, horizontal rain, the story is the same. the mighty dave t makes belgians look like ballet dancers from covent garden. i wish i was that tough, but in truth, i'm not. when the mercury takes a dive towards the foot of the thermometer i am clad in every layer deemed appropriate, and there is not a chance that those fingers will be laid bare to the elements; i want long fingered coverings, preferably with an element of cosy and definitely with the means to repel unwarranted precipitation. though the cyclist's torso can be well insulated from the cold and wet through a wide range of appropriate garb, there is little worse than sodden hands. flicking gears up and down, interspersed with intermittent braking duties is rarely guaranteed to have blood pumping through those digits. 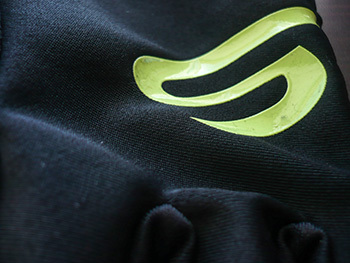 and that's sort of where endura's equipe exo waterproof softshell gloves have come to my aid. i cannot pretend that even this part of western scotland has experienced anything like arctic conditions of late. in fact, we have been blessed with an indian summer, one that has proffered less than the amount of precipitation one would normally expect in late september/early october. however, as is standard procedure this far west, the yukky stuff often appears unannounced, meaning adherence to the boy scouts' motto of old 'be prepared'. that's another purpose for those three rear pockets; wear one pair of gloves and carry an alternative. just in case. i would love to relate that i manfully powered my way through driving rain for hours on end, pausing only to empty my helmet periodically by the roadside, but melodrama is off the menu today. however, i did undertake a lengthy period of wet wind tunnel testing on the long way to debbie's for a particularly stunning cup of froth, a drink that was held in impressively dry hands. 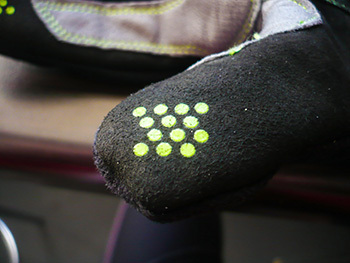 aside from the fluorescent green equipe logo on the back, there are also some similarly coloured dots at the tip of each finger, offering grip on slippy carbon gear levers. and doing likewise on the bars or lever hoods are light grey contrasting panels of pittards leather, surrounding panels of tough microfibre on the palms and thumbs. 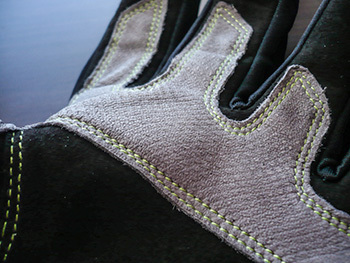 this time round, endura have got it darned right; there is soft and fluffy snot wipe material on the back of both the thumb and forefinger, and the cuffs are ideally close-fitting to keep any wayward elements from taking a look inside. like most items geared towards winter riding, there are strategically placed reflective strips to inform approaching headlamps of your speedy existence. the pliable, softshell outer contains an insulating waterproof membrane that allows the outer layer to face the elements while those dry, toasty hands inside think all their christmases have come at once. the only two minor ailments i think worth mentioning revolve round minor irritations in trying to shift one of those gear flip levers while riding in the drops. the forefinger and middle fingers were just a smidgeon too long, and the extra bits regularly caught on the inside of the brake lever blade. however, i'm willing to share the blame 50/50 on that one. and when those toasty fingers have to be removed and replaced (i discovered this while taking photographs), sweaty hands make it a harder process than it needs to be when putting the gloves back on. but that's not a problem unique to endura. 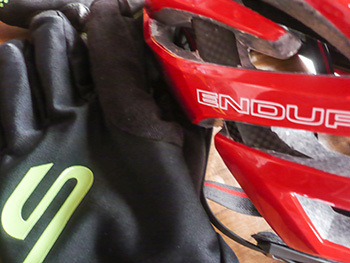 endura's equipe range inhabits the upper regions of quality cycle clothing, from the tips of these exo waterproof gloves to the toes of their waterproof overshoes. as has oft been said, 'there's no such thing as bad weather, only bad clothing choice.' these are a very good choice. 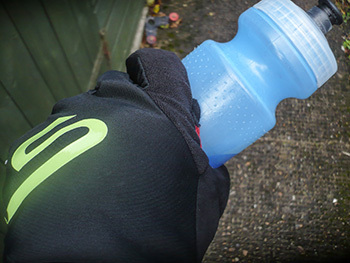 endura equipe exo waterproof gloves are available in small through to xxl at a retail cost of £54.99.